LipsNspritz of the … er … Fortnight. I hate being ill, and I really hate being ill to the extent that it interferes with my posting schedule. 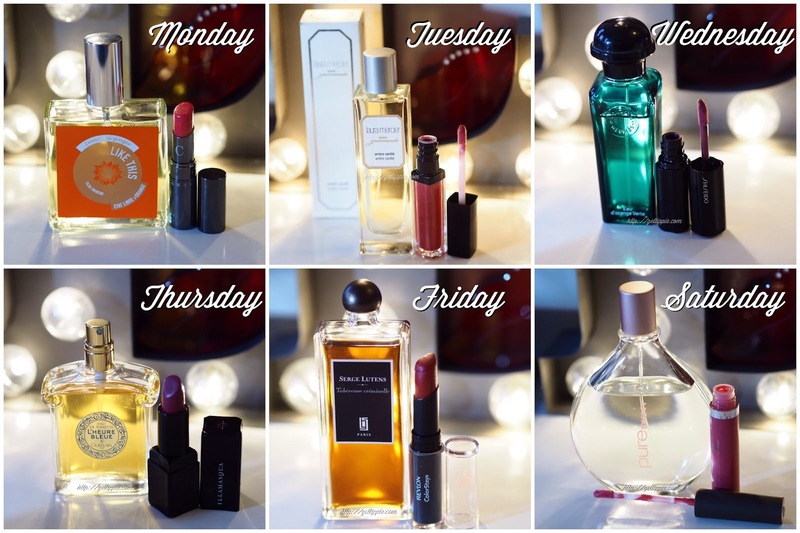 Nonetheless, here’s a double-dose (whether you wanted it or not, frankly) of my weekly diary of lipstick and perfume-wearing. The above pic is from the week ending 22/11/15. Monday was Etat Libre d’Orange Like This, alongside Chantecaille Lip Chic in Wild Rose. Like This is probably my favourite “gourmand” fragrance, being a blend of pumpkin, mandarin, ginger and immortelle. It should smell like a pumpkin pie – which it does, to an extent – but it also smells warm, sophisticated and slightly tweedy from the prickle of ginger. Perfect for autumn, and just plain delicious at any time. Tuesday was continuing the gourmand theme with Laura Mercier Ambre Vanille, alongside Laura Mercier Lip Glace in Rose. Both are easy and simple to wear, without being too challenging. Ambre Vanille is sweet and warm, and Rose is a beautiful neutral, which will work on many colourings. Wednesday brought Hermes Eau d’Orange Vert which is one of my favourite citrus fragrances of all time – I go a little insane for mint in fragrances, and this combination of bitter orange, sweet orange, and just a hint of peppermint oil makes me a little weak at the knees. I only wish it lasted longer. I wore it with the rosy mauve of Shiseido Lacquer Rouge in RD529, which is quite an opaque liquid lipstick. Thursday I wanted to wear a classic, so I did. Guerlain L’Heure Bleue, a beautiful dance of orange blossom and iris, coupled with vanilla and a little spicy carnation, I adore this fragrance. It feels blue all the way through, so I wore a blue-toned lipstick too, which was Illamasqua Magnetism. I got several compliments on the fragrance, as I always do when I wear it, and resolved to wear it more often. Which I will when this project is over. I fully intended to wear Tuberose Criminelle by Serge Lutens on Friday, but I was too ill to cope with the rubbery camphoraceousness (TOTALLY a word – if possibly not the spelling). I spent the day feeling sorry for myself in pyjamas instead. Saturday I was attempting to make myself feel better, so a hot shower and a thorough dowsing in DKNY Drop of Rose, which I love for its soft and rosy approximation of baby powder, and a slight resemblance to Ombre Rose by Jean Jacques Brosseau. It is pure comfort in a bottle, and I love it. I paired it with Becca lipgloss in Palm Breeze, a bubblegum pink that wasn’t too challenging.